Finally, we’re back at it with our very first Dark Ages review. I guess you could call it our second season. No? Regardless, this is a new chapter for our podcast and we’re glad to bring you all along with us. In this episode, we review the corebook for White Wolf’s Dark Ages line. Vampire: the Dark Ages takes place in the dark, medieval World of Darkness in 1197. 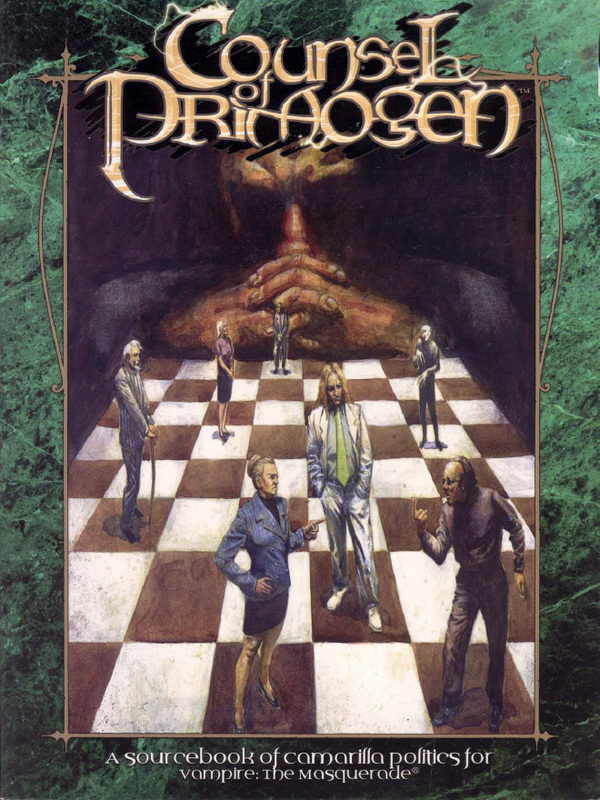 Dark Ages represents the first of three historical game lines including Werewolf: The Wild West (1997), and Mage: The Sorcerer's Crusade (1998). 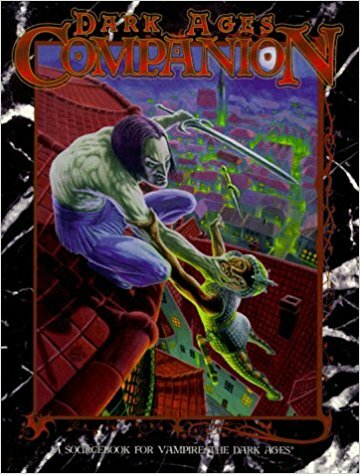 This book was published in March of 1996 by White Wolf Studios. It was designed by Jennifer Hartshorn, Ethan Skemp, Mark Rein•Hagen, and Kevin Hassall. This, my childer, is the Long Night. The Age of Learning is toppled and forgotten. The Age of the Empire drowned in its own bile. This is an Age of Darkness. Look there, my childer, upon the lightless wild places, where no law exists save that of tooth and talon. Behold the human cities as well, where we may be as lords when the sun gutters and dies. Beware, my childer, of thy eternal enemies: of the savage ones, the skinchangers, who hunt as wolves. Of the knights of fire and sword, the witch-slayers. Of the burning scions of the Pit itself. But above all, my childer, beware one another, for we shall always be our own direst foes. This, my childer, is the Long Night. It is thine. In this episode, we combine the final two V20 books: Ready Made Characters and Lore of the Bloodlines. Ready Made Characters brings you a selection of unique and interesting characters from each of the main 13 clans, for use as starting characters or as NPC characters. Additionally, the book includes charts for coteries and ideas for inclusion in your game. Lore of the Bloodlines continues where Lore of the Clans left off; detailing the rare bloodlines of the World of Darkness. Containing the nine bloodlines of the final nights, including: Baali, Daughters of Cacophony, Harbingers of Skulls, Kiasyd (settle down, Ian), Nagaraja, Salubri, Samedi and True Brujah. 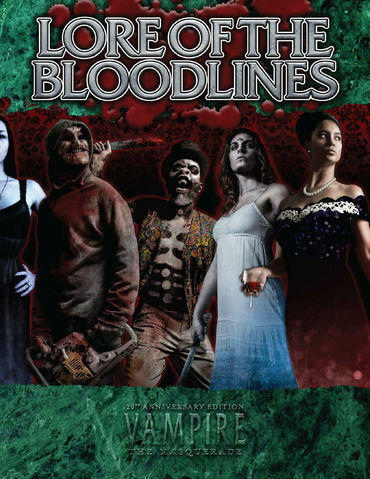 Additionally, you’ll find a wide variety of powers, disciplines, merits and flaws, and a ton of other tasty bits about these Vampire: the Masquerade bloodlines (not to be confused with the video game). Ready Made Characters was written by Matthew Dawkins and produced by Eddy Webb. It was Published July 6th, 2016 for Onyx Path Publishing. Lore of the Bloodlines was written by Matthew Dawkins, Eloy Lasanta, Andrew Peregrine, Neall Raemonn Price, Eddy Webb, and Rob Wieland. It was published April 26th, 2017 for Onyx Path Publishing. 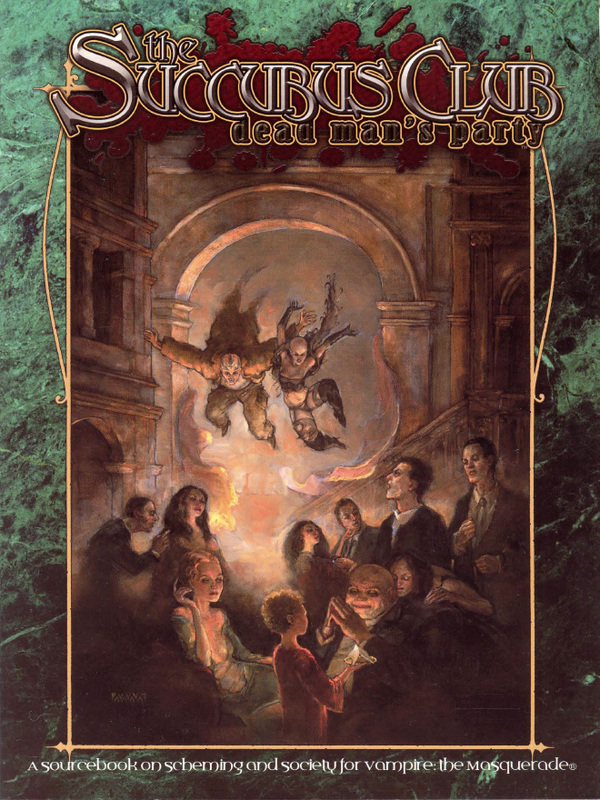 Running a one-night game of Vampire: The Masquerade 20th Anniversary Edition? Wanting to start up a new chronicle, but your players aren't sure what to play? Looking for some examples of how to use the material in Lore of the Clans? The Clans are not the only vampires that strut, if I might steal from the Bard, upon this great stage of fools. There are the errant Kindred inaccurately collected under the sobriquet of "bloodlines." While their role in the eternal conflict between the childer of Caine is small, it is often incredibly impactful. This week, Bob and Nate discuss and review Lore of the Clans. 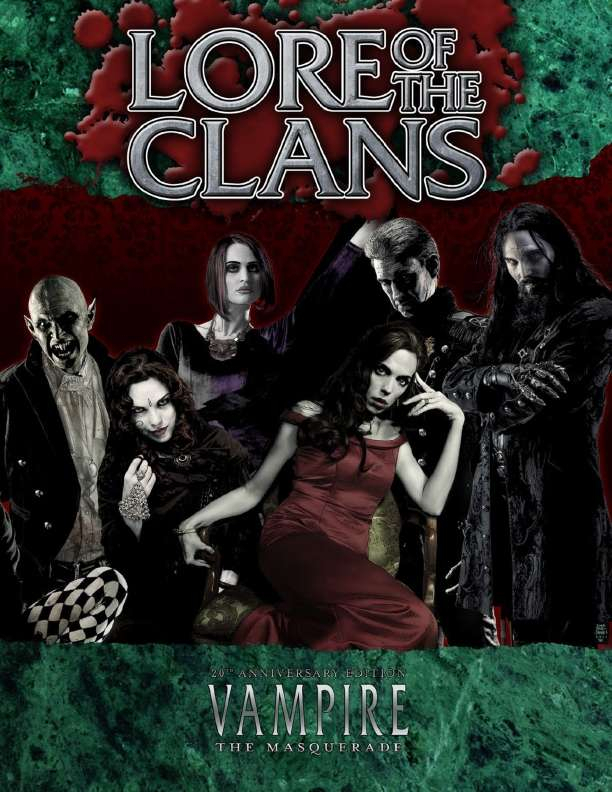 Released in 2015, Lore of the Clans is a single sourcebook detailing all of the clans for play in Vampire: the Masquerade’s 20th Anniversary edition. Additionally, this book details info about the Caitiff - classless amongst the damned - and the Antitribu. This book was written by Alan Alexander, Kevin Czarnecki, Joshua Doetsch, Matt McElroy, Andrew Peregrine, Ree Soesbee, Rob Wieland, Christopher Wilde and released on December 23rd, 2015 for Onyx Path Publishing. It has been a few weeks since our last podcast. Since that time, White Wolf released their first two sourcebooks for the new 5th edition of Vampire: the Masquerade. What was first excitement from the community quickly turned into overwhelming outrage. Much of the anger was due to the inclusion of a chapter relating to kindred involvement in an ongoing conflict in Chechnya. Needless to say, there has been massive backlash because of this chapter. Over the course of our two week vacation, the books have been released, pulled from the market, White Wolf’s structure as a company has changed, and the future of the World of Darkness property is in question in the eyes of many fans. Never the less, we’ve been asked by many in the community to review the material as they were originally presented. Also, many have asked us to speak on the situation with White Wolf as a whole. Please remember, we are commentators and not contributors. We know as much (and maybe less than many) as any other fans when it comes to industry specific stuff. In other words, a lot of what we present is simply speculation. A word of caution: What we present is our opinion - and it’s an opinion that some people may be put off by. We offer no apologies for how we feel about the exploitation of human suffering for profit. We believe strongly in the sentiment of people over games. If that turns you off from our podcast, so be it. Fun should never be had from the real world misery, suffering, and death of others. We welcome all civil discourse about this topic but will not tolerate disrespect from any party. We’re all in this together.